I am going to Mikes Family Reunion today, in to valley of the beast. I AM the only UTAH fan out of hmm maybe 50 -100 people. I am wearing my Utah shirt to the reunion. All I want to say Is I'm excited to go to the BYU pre-game dinner and sit in the cougar club DECKED OUTALL IN CRIMSON RED! GO UTES! The Love/Hate relationship of Thanksgiving! So this post might be kind of bratty.... I am going to brag because I the the most amazing Husband, Family and Friends! I want to look back and remember this birthday forever! Mike woke me up at 8:00 and was singing Happy Birthday and brought me this. I had one bite of Trix which is weird because its my favorite, but I was too excited! Yes I am a closet nerd! He always told me I could never own this game because I would get addicted and he would never see me. SURPRISE!!!! 1. The contact case. He said" because you will need to see well". 2. The Green Sharpe! He said" so you can take notes in your favorite color." 3. The Bird Feeder Kit. He said" So you don't forget about the world"
4. The Mouse its made for gaming! He said" I will need it for the next present so I can be the best." 5. WOW (World Of War Craft) He said" Because I love you. Sweet hat I know its the bomb! So my car has been at Paydens house from Thursday till Sunday night late and well I had a very low tire. Mike was out in the cold filling upmy tires. While I sat in his car and stayed warm what a nice husband! Come and celebrate Nikki's 22nd birthday! She loves Thai and thats where were going for din din at 7:00. Were also going to Tucanos for lunch at 11:30 so if you want to come to that instead or also you more than welcome. My birthday is on Monday November 23, 1987 which means I am 22 years old and I feel weird! Not old, not young just WEIRD! I didn't think I would be married at 22, but this is the happiest I have ever been. I just thought 22 was so far away and now here it is! Its offical HALLoween is our holiday, because it has our name in it ha ha ha. On Thursday night Mike, Nikki, Payden, Colby and Heather carved pumpkins. I carved Mini mouse and it was cute, but I didn't get close up of her :( On Friday night my little brother called me to come carve pumpkins with him its tradition so Mike and Payden and I went to my parents and carved pumpkins with Lynne, Theresa and Dane. 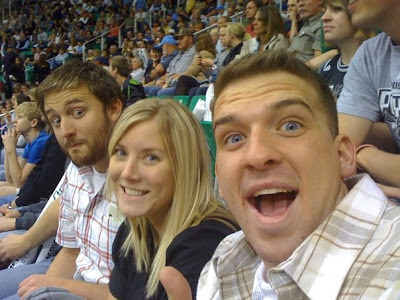 While the rest of the boys watched the Jazz game. On Saturday night (HALLOWEEN) We all went to Gandis then went shotgun shooting then to the parents house to show them our costumes then finally Kristen's Party! It was quite the weekend! The wise man built his house upon a rock! Mike and I have decided to take pictures of the houses that we like. So we can build one that has all of the elements that we want. Its strange how much we think alike. I LOVE IT! There are four things on the outside that I think my dream house will need. #1. Tree line drive way or house on top of a hill. #2. Columns of some sort! #3 Stone its all about the texture! #4 White picket fence! #5 Balcony's of some sort defiantly one from our bedroom window. Decks can be included here as well, I like having a place to sit and watch the world go by. As for the inside of the house that's a whole nother post! Mikes first pick he loves little houses! This is his favorite house in PG. He wants to have some projects that he can fix up and this is where he would love to start.